I just got back from a trip to Boston where I took part in several roundtable discussions with indies and Valve that were mostly about how to make games that have a chance of selling OK and related topics. I wanted to summarise my thinking on this topic because despite the wealth of information out there I still see many indies (new and experienced) needlessly making the same mistakes. As per usual, my blog post is assuming that you are running a business, or are thinking of doing so. I’m a full-time indie and so I write about what I know. This is why we all got into making games right? We love games, and we want to make games. Some of us keep it as a hobby and some of want to turn it into a part-time or full-time business. I have a Google doc of game ideas that is 27 pages long. These aren’t even ideas I have sat down to think about, they are just random ideas that spawned over time. Each page has approx. 5 games on it. So it’s approaching 150 game ideas. I could probably think about another 100 in a day if I set my mind to it. Ideas are not a problem. Filtering them to something viable is the challenge, and that’s where the Venn diagram above comes in. These constraints should help you realise that making a AAA-quality MMO is not viable, and nor are a bunch of other things. This is why I stick to 2D games with a short development cycle (mostly) that don’t cost too much too make. Watch my talk on this topic. Add to that the fact that many people over-estimate their capabilities and under-estimate how long making a game will take, and you run into big problems. So make sure you are very clear about what you can realistically achieve and err on the side of caution. However, if you choose an oversaturated market, the audience may be huge, but it will be very hard to stand out in that market unless you make a) a game with something special about it and b) one of the best examples of games in that market. Conversely if you choose a niche market that is too small, you may not make enough sales to survive. Also remember that unless you have a huge advertising budget, or get some kind of mega store featuring, or your marketing excels in some other way, that you will only reach a fraction of that market anyway. This is why you cannot base your projected sales on outliers in a market. Anyway, do your research. Use SteamSpy, read postmortems, talk to indies, study the market until you have a good “feel” for what sort of games sell backed up by hard numbers. I do this all the time because it’s a constantly shifting landscape. 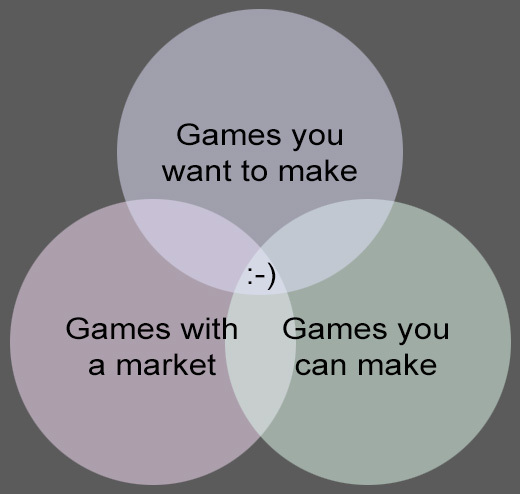 If you are a hobbyist dev or you don’t need to make money from your games, this greatly simplifies things and you can leave out this entire circle on the Venn diagram. Though you may still want to reach an audience for your game, depending on your motivation for making it. Work out how long your game will take to make, what it’ll cost, and what sort of revenue your chosen game idea could realistically make in its market. Will you be able to breakeven or even, gasp, make a profit? Can you get some funding to reduce your personal costs? What happens if it takes too long or you run out of budget? What happens if you don’t breakeven? This blog post is intended to be a reminder for all current and potential indies rather than a deep dive into each topic. Also there are of course other considerations to take into account and those will alter depending on your personal circumstances. Also please bear in mind that even if you select what is in theory the right game for you, there are absolutely no guarantees it will be a success. However, I’m pretty sure that the above diagram is a good starting point in order to nudge you in the right direction. Good luck! Anything I’ve missed? Let me know in the comments, thanks. This entry was posted on Wednesday, October 3rd, 2018 at 9:41 am and is filed under Business, Game Development. You can follow any responses to this entry through the RSS 2.0 feed. Both comments and pings are currently closed.